"Downtown Portland" redirects here. For downtown Portland, Maine, see Old Port. By the early 1970s, parts of Portland's central city had been in decay for some time. New suburban shopping malls in the neighboring cities of Beaverton, Tigard, and Gresham competed with downtown for people and money. Unlike many downtown revitalization efforts around the United States at this time, Portland's plan did not call for widespread demolition and reconstruction. Robert Moses, the designer of New York City's gridded freeways, expressways, and bridges, designed a plan to revitalize downtown Portland. Moses charted a highway loop around the city's central freeways, which would become Interstate 405 as it links with I-5 south of downtown. Additionally the creation of a downtown transit mall in 1977, a new waterfront park in 1978 (later named after Governor Tom McCall) in place of a freeway, the creation of the Pioneer Courthouse Square in 1984, the opening of the Portland–Gresham light rail line in 1986, and the opening of Pioneer Place mall in 1990 successfully drew or retained businesses and lured customers. After 1990, downtown Portland dominated the city's development, with 500,000 square feet (46,000 m2) more development there than on the east side (Lloyd District, Central Eastside Industrial District, and Lower Albina). Downtown has numerous surface parking lots, which contradict the city's efforts to promote higher density and create the storefronts needed for a vibrant downtown. Some changes are being made slowly, such as the creation of the Smart Park garage system, and conversion of a surface-level parking lot into a park with underground parking at Park Block 5 between the Fox Tower and Park Avenue West Tower. Outside the downtown area there are three other road bridges within Portland limits that cross the Willamette River: the St. Johns Bridge and Sauvie Island Bridge (to the north) and the Sellwood Bridge (to the south). Most streets in downtown Portland are one-way. Naito Parkway (two-way, formerly known as Front Avenue) is the farthest east, while most of the high-rises end by I-405 to the west. Interstate 5 runs on the opposite bank of the river, crossing over on the Marquam Bridge. U.S. Route 26 connects downtown Portland to the Oregon Coast and the Cascade Range. Downtown is also served by several forms of public transportation. TriMet, the regional mass transit agency, operates MAX light rail on two alignments in downtown, one running east/west on Yamhill and Morrison streets and north/south on 1st Avenue, the other running north/south on 5th and 6th avenues. On the latter two streets, an extensive transit mall—known as the Portland Mall—limits private vehicles and provides connections between more than fifty bus lines, MAX light rail, and the Portland Streetcar. The southern part of downtown and the West End are also served by the Portland Streetcar system, operating from South Waterfront north into the Pearl and Northwest Portland districts. The system currently has two routes, measuring 7.2 miles (11.6 km) end to end, and connects in South Waterfront with the Tram (aerial cableway) to Oregon Health & Science University (OHSU). Starting in 1975 and continuing for almost four decades, all transit service in downtown was free, as downtown was entirely within TriMet's Fareless Square, which also covered a portion of the nearby Lloyd District after 2001. However, in 2010, free rides became limited to MAX and streetcar service – no longer covering bus service – and the zone renamed the "Free Rail Zone", and in September 2012 the fareless zone was discontinued entirely, because of a $12 million shortfall in TriMet's annual budget. ^ "Portland Maps: Downtown". 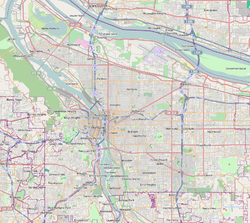 City of Portland:Portland Maps. Retrieved 2019-04-12. ^ MacColl, E. Kimbark. The Growth of a City: Power and Politics in Portland, Oregon 1915–1950. Portland, Oregon: The Georgian Press. p. 2. ISBN 0-9603408-1-5. ^ "Beloved and Abandoned: A Platting Named Portland". Planetizen.com. Retrieved 2016-07-08. ^ Fogelson, Robert (2003). Downtown: Its Rise and Fall, 1880-1950 (3rd ed.). Yale University Press. p. 395. ISBN 978-0-300-09827-3. ^ Mesh, Aaron (November 5, 2014). "Feb. 4, 1974: Portland kills the Mount Hood Freeway". Willamette Week. Retrieved November 21, 2014. Every great civilization has an origin story. For modern Portland, it is an exodus from Moses. That’s Robert Moses, the master builder of New York City’s grid of expressways and bridges who brought the Big Apple its car commuters, smog and sprawl. In 1943, the city of Portland hired Moses to design its urban future. Moses charted a highway loop around the city’s core with a web of spur freeways running through neighborhoods. The city and state embraced much of the plan. The loop Moses envisioned became Interstate 405 as it links with I-5 south of downtown and runs north across the Fremont Bridge. ^ Jackson, Reed (July 16, 2012). "Perceptions of Portland's east side changing". Daily Journal of Commerce. Retrieved 2012-07-23. Before the mid-1990s, development on the east side was sparse; and even then, large construction projects were rare. Between 1990 and 2010, 500,000 more square feet of development took place in downtown than in the east side’s Lloyd District, CEID and Lower Albina area combined, according to data collected by the Bureau of Development Services. ^ "State of Parking 2015". City of Portland. Retrieved 2016-07-08. ^ "The Water". Portland State University. Archived from the original on October 31, 2006. Retrieved August 28, 2011. ^ a b Wood Wortman, Sharon; Wortman, Ed (2006). The Portland Bridge Book (3rd Edition). Urban Adventure Press. ISBN 0-9787365-1-6. ^ "Better have that bus fare today; Fareless Square ends". Portland Tribune. January 4, 2010. Retrieved June 15, 2015. ^ "Emporis Building Database". Archived from the original on 2007-09-29. Retrieved 2007-09-02. 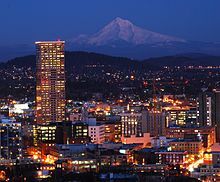 Wikimedia Commons has media related to Downtown Portland.